ability to dominate a leader of the totalitarian forces. (5) The heroine is imprisoned by the totalitarian forces. (6) A leading character returns to the family home to find it destroyed. and the daughter of one of the leaders of the democratic forces. Wars) or destroyed (Battlestar) by the totalitarian forces. musical entertainment is offered by bizarre, non-human creatures. contrary to the stereo-typical sleek, new appearance of space age equipment. The court listens to this list and since they’ve apparently never seen another sci-fi film or read any part of Arthurian legend, they decide that these story elements are unique enough to warrant watching the film to see for themselves if BSG is a rip-off or not. "After viewing the Star Wars and Battlestar motion pictures, we conclude that the films do in fact raise genuine issues of material fact as to whether only the Star Wars idea or the expression of that idea was copied. At a minimum, it is a close enough question that it should be resolved by way of a trial. We intimate no opinion whether the films are substantially similar as to either idea or expression, but state only that reasonable minds could differ on those key factual issues." This particular decision results in the case being remanded to the lower court, where it was eventually decided in favor of Battlestar Galactica. Of course, by that time, the point was kinda moot since the series was off the air and the Star Wars films had already been released. Still, the relaunch of the BSG franchise 20 years later probably would have been a whole lot different if this case had gone the other way. 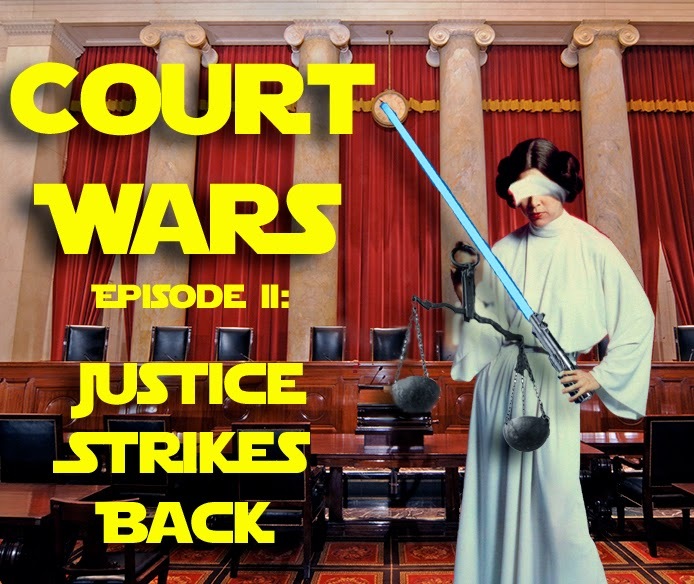 Sharkey v. Moneypenny-Sharkey, (2007 WL 1452722 N.D.Ohio) 2007: A case involving allegations of domestic abuse, where among other things, the husband claimed his wife "…became angry with him on several other occasions and hit him with his Star Wars Lightsaber." He was seeking monetary damages, but the case was dismissed. Apparently the court didn't have much sympathy for a man whose nickname was "The Impaler." No, that's not a joke. All the fun of an aquarium where the fish never move. "When the market for Hasbro Corporation's (‘Hasbro’) aquarium toy suddenly dried up, one of its vendors was flush with packets of gel powder that Hasbro no longer needed. Plaintiff Cloud Corporation (‘Cloud’) argues that by directing it to make a change in the formula for the gel powder, Hasbro effectively ordered the larger number of packets that the new formula generated. Hasbro refused to take delivery of packets in excess of the amount it had ordered prior to the formula change, and Cloud brought this action for damages. Hasbro's refusal to pay for the extra packages, Cloud alleges, constitutes a breach of contract." "To create the transparent gel, 'Wonder World' consumers would mix a packet of powder with distilled water and, using tweezers, would suspend plastic fish or other toy objects in the gel to create the toy aquarium." "Cloud, a Delaware corporation with its principal place of business in Des Plaines, Illinois, manufactures high-speed packaging machinery and uses this machinery to package powder substances such as Kool-Aid, Swiss-Miss Cocoa, and Domino Sugar." "Hasbro has designed and marketed such well-known toys as Monopoly, Mr. Potato Head, G.I. Joe, Star Wars figures, and, more recently, Pokemon merchandise." Hasbro has hired Cloud to package the material to create the clear gel used in the toy, which is called Laponite. "In 1995, Hasbro engaged Cloud to (1) blend Laponite (which would be supplied to Cloud by Southern Clay) with a preservative called Germal and salt, according to a Hasbro formula, (2) package the mixture, and (3) send the packets to one of three Hasbro affiliates (Sunshine, Early Light, and Kam Hung) in the Far East." So, to clarifiy, Hasbro needs packages of this powder for their toy, so it’s using Cloud to supply them. Cloud gets the powder from the supplier, packages it, then sends it to Hasbro. Hasbro’s purchasing department informs Cloud that Cloud will be the one responsible for placing the orders for the powder, since Cloud was going to be in charge of inventory. Hasbro tells Cloud how many packets it needs, Cloud calculates how much powder to order and places the order. Cloud informs Hasbro how much it ordered, gets a letter from Hasbro’s purchasing agent, then Cloud packages the powder for Hasbro. Hasbro has a meeting with the supplier of the powder and they strike a price for the significant amount of powder that Hasbro thinks it will need. Cloud is not invited to this meeting and has no input on how much Hasbro is requiring Cloud to pay to purchase the Laponite. They begin to create the little packets and ship them to Hasbro, when Hasbro’s chemist discovers a better way of creating the powder and instructs Cloud to tell the supplier to change the formula. The new version of the powder is cheaper and will create 33% more packets of powder than the current formula. Cloud begins to supply Hasbro with these packets, but then the line is cancelled and Cloud is left with a LOT of excess powder it no longer has a use for. Hasbro refuses to reimburse Cloud for that expense. The case delves into a variety of contract formation issues which are complicated and outside the zone of our interest, suffice to say that the court rules for Hasbro, saying that although the formula change resulted in more powder available to package, Cloud was under no obligation to lower the per package price or it could have gotten Hasbro to agree to pay for all excess powder in the first place. Kendle v. Kenner Parker Toys, Inc. (Not Reported in N.E.2d) 1988: Kenner employee sues over a slip and fall, resulting in a "contusion to right shoulder, hip, knee, head and back." No final decision is given in this case. Thain v. State (Not Reported in S.W.3d) 2004: A man is convicted of murder. 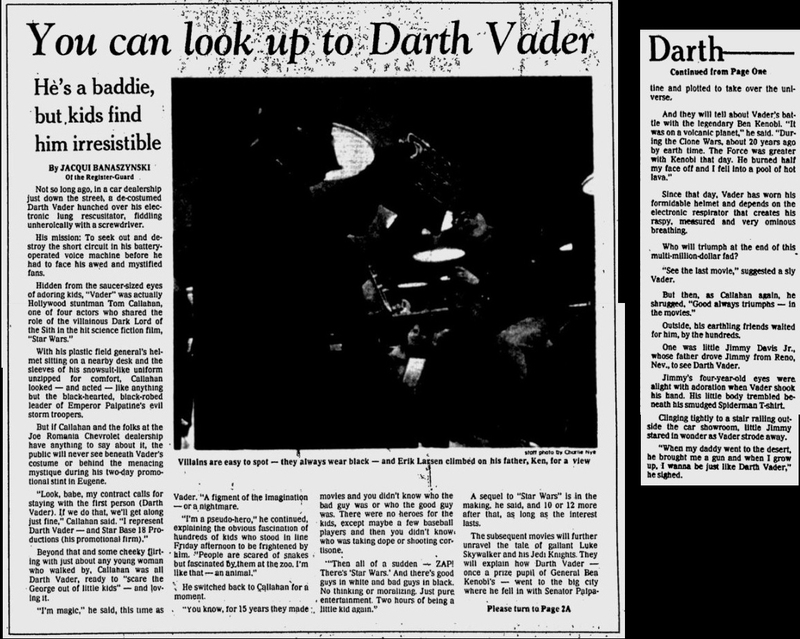 The court describes his room as having among other things "...many ‘Star Wars’ figurines that were still in their packages and displayed on the wall." He gets 65 years. People v. Kalwa (306 Ill.App.3d 601) 1999: A man is accused of 1st degree murder and armed robbery. When cops show up to search his house, they find evidence against him. Defendant then asks officer on the scene if his "Star Wars posters would fit in an 8 foot by 12 foot prison cell." The officer apparently finds this statement rather suspicious and this, coupled with other evidence, leads to the man's arrest. He's convicted and gets 100 years and 30 years, but they run concurrently. The court fails to mention if his cell does actually have room for his posters though. 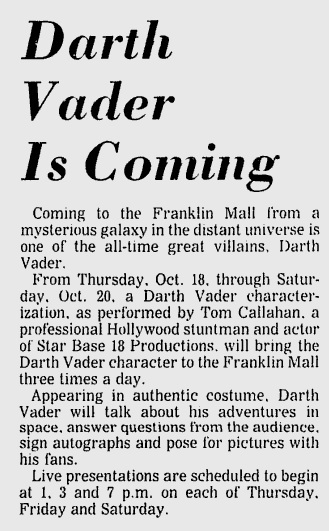 Actual ad for one of Tom Callahan's appearances as Darth Vader. Graham v. Callahan (1984 Tenn. App. 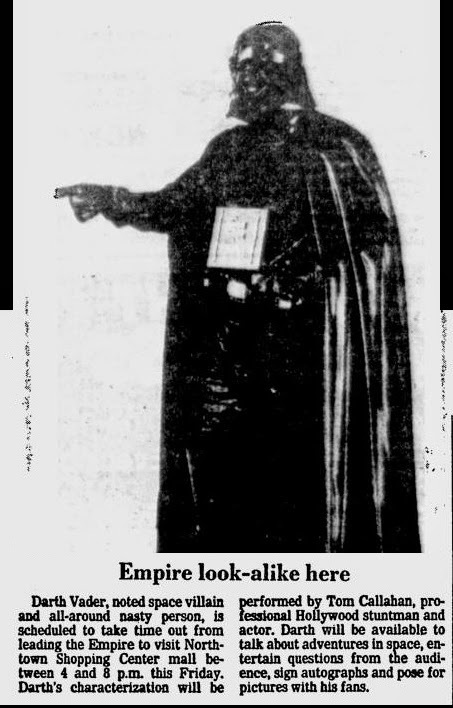 LEXIS 3235): A case concerning an injury which took place during a personal appearance by "Darth Vader" at a mall Tennessee. "The Defendant, Tom Callahan, is a professional en-tertainer [sic] who characterizes Darth Vader. The Defend-ant-Appellee is the booking agent for Callahan and en-tered [sic] into a contract on his behalf with the Defendant, Cleveland Mall Merchants Association, for him to per-form at the Cleveland Mall on July 28 and 29, 1980. Callahan's performance apparently included an act in which he would swing a sword over and around the body of a volunteer from the audience [sic]. On July 29 Plaintiff Joyce Graham volunteered to participate in the performance with Callahan and in the course of the act she was struck on the side of the head with the flat side of the sword, resulting in personal injuries." The court ultimately rules that the booking agent could not be held liable for the injuries, based on the fact that the booking agency did not have the power contractually to control what the actor did on stage during his performances. Anthony v. Mazon (2006 Cal. App. Unpub. LEXIS 5625): A case related to a divorce preceding. 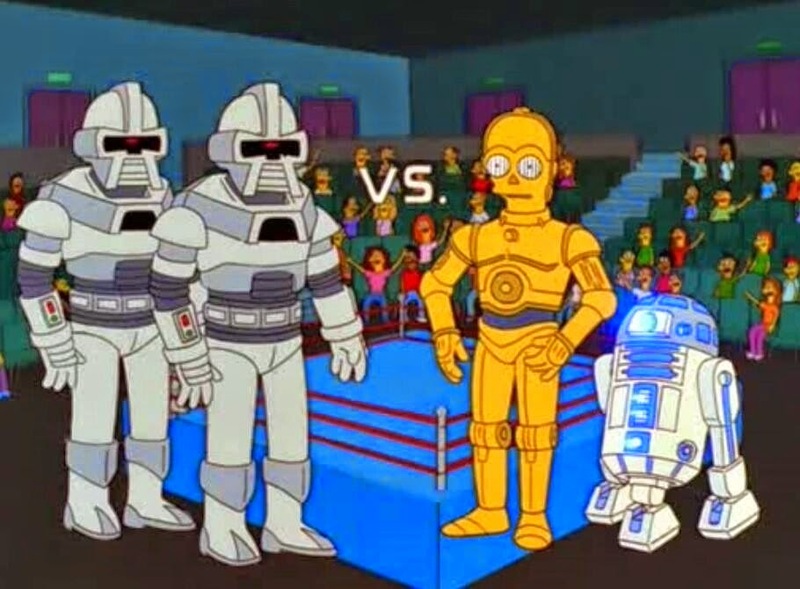 The judge is so angry with the parties behavior before trial that he notes, "This case is somewhat akin to deciding a dispute between Darth Vader and the Borg....". CPG Products Corp. v. Mego Corp. (1981 U.S. Dist. LEXIS 17657): A case dealing with Kenner's Stretch Armstrong toys. Apparently, Kenner believed that Mego had misappropriated Kenner's trade secrets in the design and manufacturing processes behind the Stretch Armstrong doll, in order to make their own line of stretch toys based on comic book characters. "The doll, which Kenner Products Division began marketing in 1976, is an elastic toy filled with concentrated corn syrup which can be stretched or moved from one position to another, and, when released, will slowly return to its original shape or position as the elastic skin reacts against the highly viscous filler. Kenner marketed these toys, known as "Stretch Armstrong," "Stretch Monster," "Stretch Octopus," "Stretch Serpent," and "Stretch X-Ray," from June 1976 to January 1979. The toy was extremely successful commercially, accounting for sales of over fifty million dollars during that period. Kenner manufactured these dolls through late 1979 and still offered them for sale in its 1980 catalogue, but it has since discontinued sales of these items." "In April 1979, Mego began marketing a line of elastic toy dolls which also consisted of shaped, stretchable skins filled with a concentrated corn syrup. Mego's dolls were marketed in two categories: large dolls the same size as Kenner's, known as 'Elastic Hulk,' 'Elastic Superman,' 'Elastic Plasticman,' and 'Elastic spiderman,' and, beginning in the Spring of 1980, smaller dolls in the figures of elastic Disney characters and 'Elastic Casper,' Through July 1980, Mego's net profit on these items has been in excess of [specifics deleted]." "The original idea for Kenner's stretchable doll figures was conceived by a CPG employee named James O. Kuhn in January 1974. He developed his idea through experimentation and design until he was able to present a prototype of the figure to Kenner for evaluation in February 1975. Kenner accepted the item for commercial development and began working on the process by which it could manufacture such figures on a mass production scale in March 1975. Kenner's first consideration was to find a process by which it could concentrate the corn syrup filler in its commercial manufacturing process to get the desired feel and play value for the doll. Kenner personnel experimented with Kenner then narrowed its search to two suppliers, thoroughly evaluating one before finally settling on. Then, once a decision was made to use a particular model, Kenner worked further with the supplier to modify that model so that it would handle the particular requirements of Kenner's manufacturing process which involved the stretch figures. Another major area of process design and development at Kenner involved the selection of equipment and procedures for filling the skins with the concentrated corn syrup. Again, after much consideration and evaluation, Kenner selected [specifics deleted] as its supplier of filler equipment. In conjunction with the filling process, Kenner decided to use a [specifics deleted]. Thus, the development of Kenner's doll and its commercial manufacturing process, from the inception of the idea to actual commercial production, covered a period of two-and-a half years. January 1974 to June 1976. 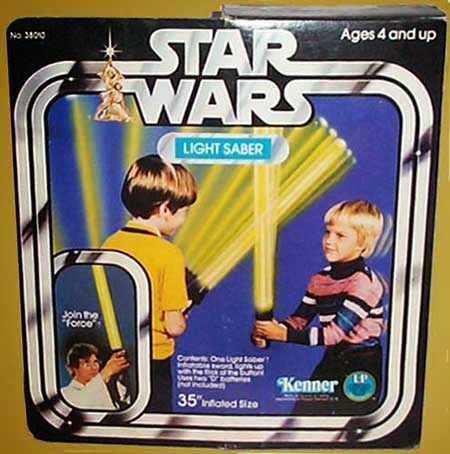 Although it took Kenner approximately two-and-a-half years from conception of the idea for the elastic toy until its actual production, it was only eleven months, from July of 1975 until June of 1976, that it took Kenner to develop and implement the production line. Mr. James Wright, the project engineer assigned by Kenner to commercially develop the elastic figure began to investigate the uses of [specifics deleted]." "Mego asserts that most of the individual components of Kenner's production line were standard equipment, and that information concerning this equipment which Kenner applied to its design and production problems in its commercial manufacture of its stretch dolls was available from sources outside Kenner. Therefore, Mego argues that these items individually or in combination did not rise to the level of trade secrets." The court agrees with Kenner and stops Mego from exporting these secrets. To me, what's most interesting about the case is how cloak and dagger everything is. Sections of the decision are redacted (I assume to hide these secrets from the public) and the engineers even use code names ("Mr. X") while talking with Mego about the process, etc. Funny to think that a rubber sleeve filled with corn syrup could cause so many problems. Are the two stories interchangeable? Zambito v. Paramount Pictures, Corp. (613 F. Supp. 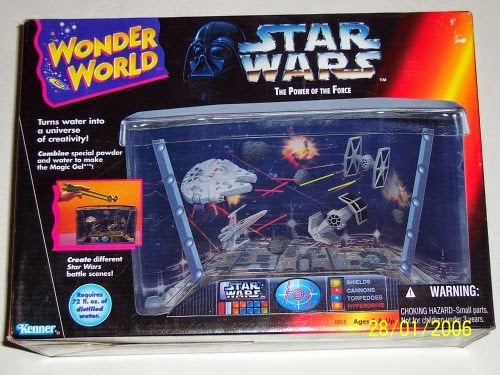 1107) 1985: This case is technically outside our mandate, in that it concerns something unrelated to Star Wars and Kenner. It does however deal with Indiana Jones, so I think it counts. In the opening scene, Zeke is informed by his former lover, Michael Colby, a female museum curator, that Zeke has been replaced as head of an expedition to Peru. Undaunted, Zeke finances his own 'bootleg' expedition with the help of a cocaine dealer who fronts Zeke the money in exchange for Zeke's promise to smuggle cocaine from Peru. Upon arrival in Peru, Zeke and his sidekick, Justo, a Peruvian Indian native, pause to taste the pleasures of cocaine and prostitutes. After assembling an entourage of Indian natives and taking as a partner, Alvarado, who supplied horses and pack animals, the party then proceeds on the expedition. Along the way, Tumba, Alvarado's servant/mistress, gives birth to a son. Shortly thereafter, Alvarado offers Tumba's services as a prostitute in return for the other Indians' share of the treasure. Zeke seeks to prevent this exploitation by pacifying the natives with cocaine. Ironically, Tumba, who is understandably grateful for this act of humanity, rewards Zeke with sexual favors. Later, an old Indian mystic tells Zeke that he can locate the cave with the great anaconda snakes, and hopefully the treasure, by observing the reflection of the sun off the side of the cliffs. Upon locating the cave, the party rappels [sic] down the side of the cliff, fights off the anacondas with molotov cocktails, and uncovers the treasure in a burial site inside the cave. As they are about to begin their trek back from the clifftop, the expedition is confronted by the script's principal antagonist, Von Stroessner, and his band of thieves. As it turns out, Von Stroessner was hired by Michael Colby and the museum to follow Zeke and liberate him of his new-found treasure. A fight ensues, in which Zeke and Von Stroessner are wounded and several Indians are killed. Zeke ultimately shoots Von Stroessner in cold blood. The expedition party continues the journey back, only to be confronted by the Peruvian National Guard. In the ensuing gunfire, Justo is mortally wounded, the remaining Indians are killed, and Zeke and Alvarado are forced to flee through the dense jungle carrying what little gold they can carry. Zeke ultimately shoots Alvarado in a quarrel over the remaining treasure, and the story ends with Zeke hiking back to civilization." "'Rainbow' is, for the most part, a somber, vulgar script replete with overt sexual scenes, cocaine smuggling and cold-blooded killing. 'Raiders,' on the other hand, is a tongue-in-cheek, action-packed, Jack Armstrong, all-American adventure story." 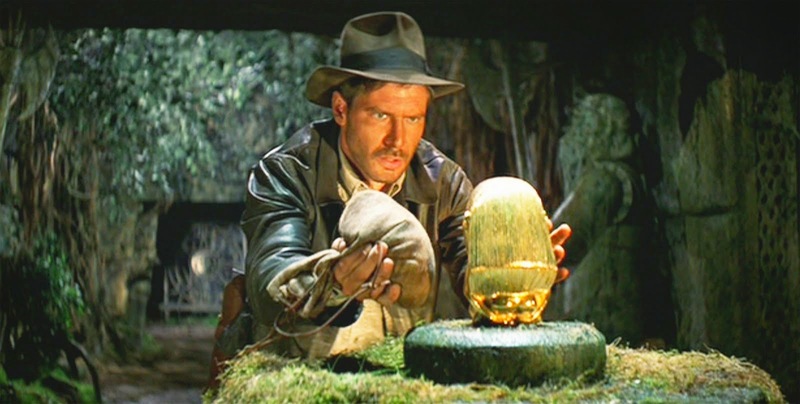 "Plaintiff argues, initially, that actionable similarity lies between the two protagonists, Zeke Banarro and Indiana Jones. Any similarity ends, however, with the fact that both are male and both are archaeologists. Zeke is basically a serious, self-interested, individual who betrays both the museum for which he works and his illegitimate 'backer,' strikes out on his own, and ends up shooting his adversaries in cold-blood. Indy, on the other hand, is a larger-than-life adventurer who, in matinee-idol fashion, remains loyal to truth, justice and the American way." The screenwriter believes that the similarities are bigger than just the main characters though, and includes supporting characters and scenes as well. "Finally, and incredibly, plaintiff asserts a similarity between Marion Ravenwood of "Raiders" and a combination of Tumba, the pregnant Indian mistress, and Michael Colby, the ambitious museum curator, of 'Rainbow.' The only similarities between these characters, however, are that they are female and that they share the common experience of a sexual encounter with the respective protagonists." "Upon close inspection, plaintiff's remaining claims of actionable similarity fall within the category of unprotectible scenes a faire. That treasure might be hidden in a cave inhabitated by snakes, that fire might be used to repel the snakes, that birds might frighten an intruder in the jungle, and that a weary traveler might seek solace in a tavern, all are indispensable elements to the treatment of 'Raiders'' theme, and are, as a matter of law, simply too general to be protectable."